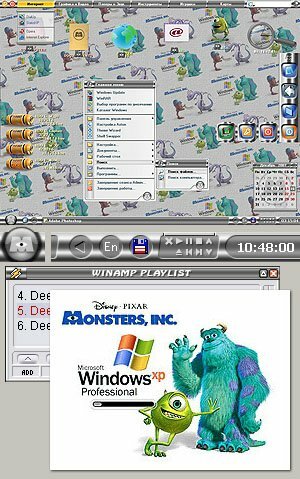 Monsters, inc. : Aston Theme with AltDesk skin. Skinned plugins: Panel, Search, mDisks, A-Clock, TaskAmp, Vista Button and standard ones. PHOTO.BMP is an empty element looking like a part of 'My Documents' folder. Replace my portrait with yours. picture with this boot screen. Install Stardock's freeware BootSkin utility ( http://www.bootskin.com ) . There are also .PSD template and entire WinAmp skin in "Skins" folder. Thanks a lot to 'Monsters, inc.' movie authors for lovely characters. I must also thank unknown author of the picture that I've used to make my bootscreen and wallpaper. E.G. doll-animation movies by Vladislav Staryevitch are almost 100 years old but they're still REALLY amazing ones. Regardless on their age. 2) As for Win'98/XP: What do you talk about? Which element of the Theme's looks like Win'98 ? to LILI: Glad to see another "Monsters" fan :) Thanks! to ALL: Thanks a lot for your comment and rate.